Retailers across the country have said the weekend has been the busiest shopping period in five years. Mild weather, improved consumer confidence and an increase in shoppers travelling from Northern Ireland are said to be the reasons for the increase. Retail Excellence Ireland said December started slowly but that consumer confidence improved dramatically after the Budget was announced. Meanwhile, Belfast retailers have reported a 30% decline in their sales figures with retailers south of the border seeing a noticeable increase in the numbers of shoppers coming from Northern Ireland. In addition, REI said the fact that Christmas Day falls on a Tuesday means more people had time off beforehand. The boost in sales figures has also been put down to the fact that many stores have already started their sales, with the ladies’ wear and footwear sectors in particular offering discount promotions. The luxury and value ends of the market are performing well, although the middle market is reporting a challenging season. The number of Christmas trees which have been sold is also up on last year. The top selling items in the Christmas shopping period have been electrical goods and gadgets. REI said retailers are noticing a marked decline in the number of novelty items being purchased as gifts, with a movement towards more practical goods such as shoes. Retailers are expecting another busy day with the traditional last-minute shopper hitting the shops, with most shops remaining open until 6pm. 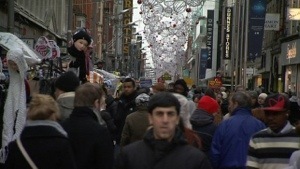 For the first time, 70% of retailers in urban areas will open for business on St Stephen’s Day. Posted on December 23, 2012, in Other. Bookmark the permalink. Leave a comment.